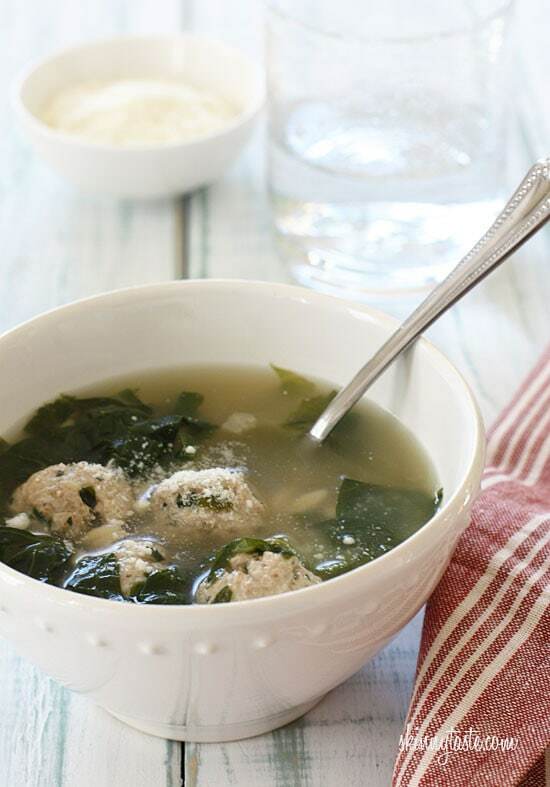 Escarole Soup with Turkey Meatballs (Italian Wedding Soup) is a delicious, easy, one-pot meal! It makes a lot, which makes it perfect to make ahead and freeze in portions for lunch or dinner for the month. This recipe is one from the archives, I re-made it this week and thought I would re-photograph it and give it a face-lift. My teen loves this soup, so I make it often just for her. When she was younger I used to pack this in her thermos to bring to school as a hot lunch. 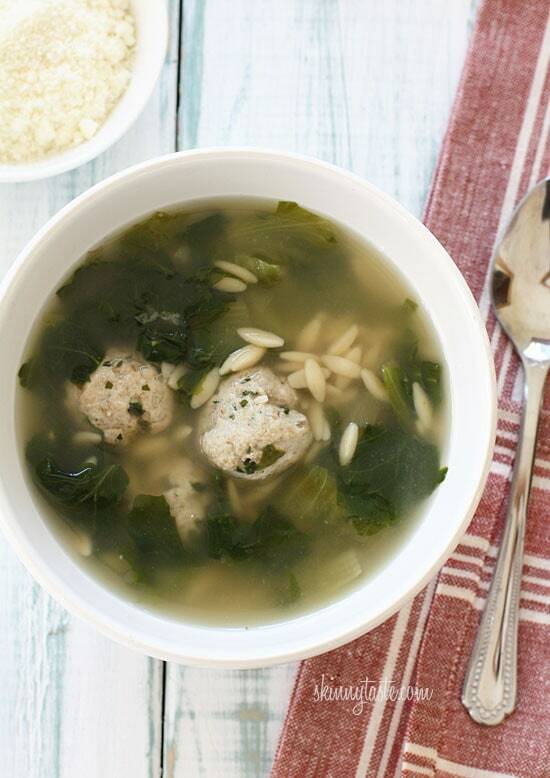 The name “Italian Wedding Soup” as a reference to the “marriage” of greens and meat in the soup. A favorite in my house, this lightened up version is delicious and satisfying. If you want to keep it low-carb you can leave the pasta out, this can easily be made gluten-free! My toddler will eat it without the greens. If you can’t find escarole, any dark leafy green would be great. Serve this with a good quality grated cheese on the side! Heat a large pot over med-high heat and add the chicken broth, bring it to a boil, covered. Meanwhile, in a large bowl, combine ground turkey, breadcrumbs, egg, parsley, onion, garlic, salt and cheese. Using your (clean) hands, gently mix all the ingredients well until everything is combined. 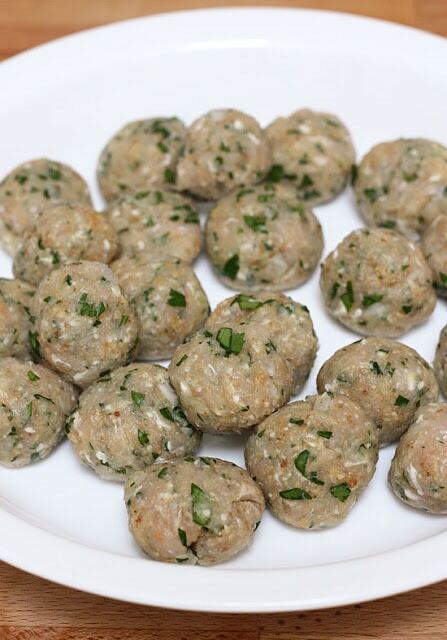 Form small meatballs, about 1 tbsp each, you’ll get about 40. When the broth comes to a boil, drop the meatballs in, add the orzo and chopped escarole. Add fresh pepper, adjust salt as needed and cook according to pasta directions, about 10 minutes or until orzo and meatballs are cooked. 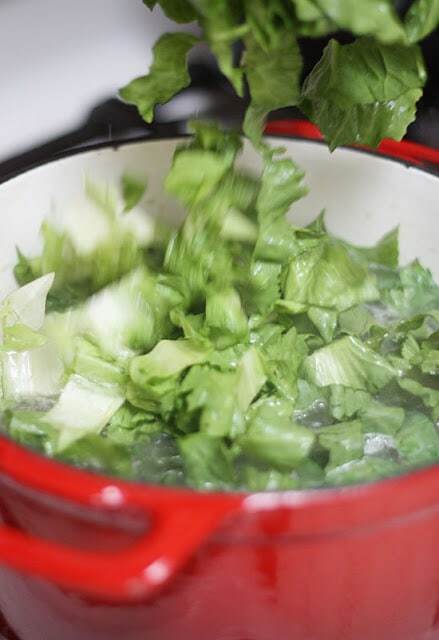 Pour the chicken broth in the pot, cover and cook high pressure 1 minute to bring it to a boil. Quick or natural release. When the broth comes to a boil, drop the meatballs in, add the orzo and chopped escarole. Add fresh pepper, adjust salt as needed, cover and cook high pressure about 5 minutes, quick release. Fantastic and simple, and with a few simple tweaks, I made it even easier (for me!) I used a combo of lean and regular (95% and 85%) ground turkey for the meatballs, and panko (I had these on hand) instead of regular bread crumbs, I also added a little parsley from my garden and a little extra garlic to the meatballs. As for the soup – almost perfect as is. I had a carrot and 2 celery stalks to use up, so I sauteed them before adding the broth, and it worked wonderfully with the extra garlic I had). The orzo really does cook quick, so add it later if you plan to let it hang out on the stovetop for a bit. There was a nice, deep flavor that developed by adding the meatballs to the broth raw, and I plan to make it this way again. Very delicious soup! Satisfying warm hug of a soup. I put turkey sausage as well as ground turkey in my meatballs. Warm , cozy and filling soup. Easy to make and satisfying. Will make again! So quick and easy but tastes like it cooked all day. So good! I cooked this using an instant pot (I am new to the IP). Do not add Orzo too quickly into hot broth, you will have one foamy mess that foams out and over the IP. Other than that little error it tasted amazing. I used Spinach! Many lessons to be learned daily with an IP. 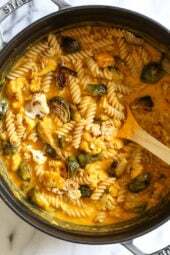 I’m looking forward to making this soup for lunches on cold L. I. days. If I add mushrooms can it be frozen? I looked at your mushroom soups and did not see any that are freezer friendly. This recipe looks amazing! Could I substitute Escarole with Kale? This recipe looks amazing? Could I substitute toe Escarole with Kale? Just finished making this soup. It is SO GOOD!! so good, I had to come back and tell you how much I like it! Thank you! ALL your recipes are always winners. I know this recipe is an oldie, but it’s new to me and I made it last night – amazing! I followed the recipe to the letter, except for one addition. 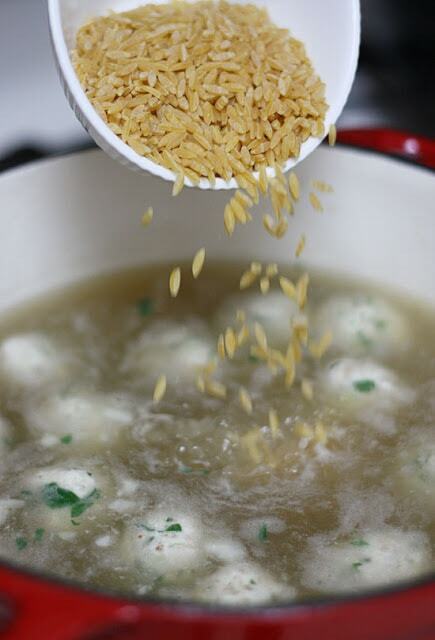 I threw a parmesan rind into the broth while cooking – a trick I also learned from you. 🙂 The resulting bowl of soup was so flavorful and hearty. Can’t wait for leftovers tonight! Oh. My. Gosh! I just made this soup with my homemade broth and it is fantastic. Delicious!! My husband and I absolutely love this soup! It was super easy to make! Thank you! Hello! Made this for the first time yesterday and it was easy and delicious! The only thing I may change for next time is baking the meatballs before I put them into the soup. The soup got a little "dirty-looking" because of cooking them in the broth. Will definitely make this again. Thank you! how many points for just the meatballs ? I made this last night and threw in some cheese tortelini – delish!! Frost this afternoon here in our place and currently it's already very cooooooold so I decided to look for a soup recipe and I found this, it's perfect for the weather today here in IL! Thanks, Gina for sharing this recipe! I made this recipe today. It was great. I think the meatballs helped to flavor the broth. WW lifetime member rejoining after having 2 kids in two years! Was so happy to find this website as so many friends keep telling me about it! I made this soup yesterday and it is DELICIOUS!! I prepacked a couple containers and labeled them with the points….which is why I'm writing. When I entered in your nutrition information into the WW etools mobile it came up as 4pts plus not 5….so that's a good thing! just wanted you and the other members to know….if that is in fact true. I entered it 3x and it came up 4pts plus! It was the best italian wedding soup Ive ever had. I have the rest of my week planned out already with SKINNYTASTE's recipes!!!!!!!! THANK YOU!!!!!!!!! 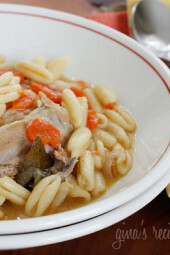 Your blog about Italian weeding soup is really awesome. 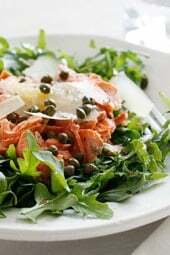 I love this recipe very much.I will definitely try this recipe. I like Italian culture, tradition, italian food etc . Last summer I have visited Italy as well as I have visited Italian restaurant. I have enjoyed Italian food very much. Delicious! I used spinach instead of escarole and it turned out great. Thanks for another tasty recipe! The only thing I'd change would be to add the orzo whenever you pull a batch from the freezer. I think the orzo will get to mushy sitting as it defrosts and then the reheating process. I do the same when I make chicken soup. I make everything but hold off on adding the rice or noodles and add them everytime when I reheat any leftovers. I just stumbled upon your website via pinterest and I am officially addicted! I love your blogging, photography and amazing recipes! This soup was the first one I made from your website and I have had it everyday for lunch and just can't get enough. I am so grateful to have found such a great source of healthy, yummy food. Keep on truckin lady! I have made this twice and followed the recipe without any problems. Delicious! I made this for dinner tonight. Overall is pretty good. I used Horizon egg whites instead of an egg, progresso italian bread crumbs and spinach. The egg whites worked well with the meatballs. You don't need 16 ounces of the spinach, I probably used 2/3 of that. I also followed a tip I saw on here about cooking the meatballs separate in water for a few minutes and then added them to the soup. Great tip! The soup wasn't cloudy with all the muck. I think it needs more chicken broth than 8 cups. The soup has a very nice flavor and is very filling. A key is to add really good parmesan to the meatballs & as a topping. Hi Gina last time I made your Italian turkey meatballs I did a double batch & froze extra uncooked meatballs. 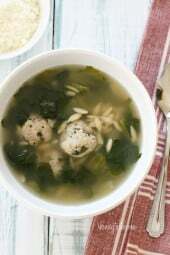 Could I use frozen uncooked meatballs in this soup or will it mess it up? I've made it before following the recipe & loved it!! Thanks Gina! I am really starting to scare myself with my cooking thanks to you! Absolutely amazing meals; keeps me in track for almost a year. This soup was no exception . So so delicious. Thanks again! This soup was delicious! I added a little shredded carrot, just for more veggies & color. It made enough that my BF & I each had a big bowl & I put the rest in the freezer for next time. Great recipe, thanks! I was going to add carrots & celery to make it more like my original (not WW) version. Thinking I would add 1 pt+, does that sound right? I'd love some tips on freezing/reheating, too! Can I make the whole soup, freeze leftovers, and reheat in the crockpot? Or should I reheat the brothy part, and freeze the meatballs separately… is so, when would I add them in? The last half hour? And what about the orzo? Doesn't it get mushy if frozen? Thanks for any help you can provide! I'm new to freezer cooking. Can you explain how you defrost/re-heat? I'd like to be able to freeze and reheat individual portions as quickly as possible. This was one of my favorite meals growing up and I am happy to have a lightened up recipe for it. Thanks!! We made this with a few changes to make it gluten free due to dietary restrictions. We used rice instead of orzo and omitted the breadcrumbs from the meatballs and added extra cheese to replace the breadcrumbs. It turned out great! Kids loved it too. Thanks! I made this last night and LOVED it (and am still loving it as I eat leftovers for lunch right now). I used Kale which worked well except I should have done a better job cutting up the pieces and removing some of the bigger stalks as it's a bit leafy – but still tasty. Also used 2/3 cup orzo to get in a few more carbs and eat as a main meal. Turkey meatballs were great, very flavorful and moist, loved being able to just drop them right into the broth. So tasty and so easy, thank you for this recipe. I'm looking forward to trying more of yours! Hi Gina. I am Gina too. Just discovered your blog and I am on a roll with the recipes. Great soup, hubby really enjoyed it! It was so easy too!! Made the pumpkin butter as well, it's heavenly!!! Thanks! This soup is so delicious!! For all those who weren't sure about the escarole and subbed spinach, I tried with both, and I have to say the escarole is superior! Definitely brought a little more flavor to the soup. I also sauteed my onions and garlic with a spritz of EVOO from my misto before adding them to the meatball mixture, it added a little more depth of flavor to an already delicious recipe. I make big batches of this and freeze 'em for an easy lunch! Thanks for this one, Gina!